The more of these stories I hear, I realize that their stories are mine and mine is theirs - we're all connected. So many families struggle to cope with MS. So many of us have lost family members and close friends. I hope that many of you recognize your own struggles in these stories, and get the same sense of support and camaraderie that I do. 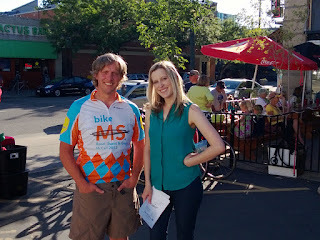 And a sense of hope that we can all work together to realize a world free of MS.
First off here's my friend Megan Nettleton, Community Relations Specialist for the National MS Society here in Boise. Megan's story is well-known within the MS community here in Boise. 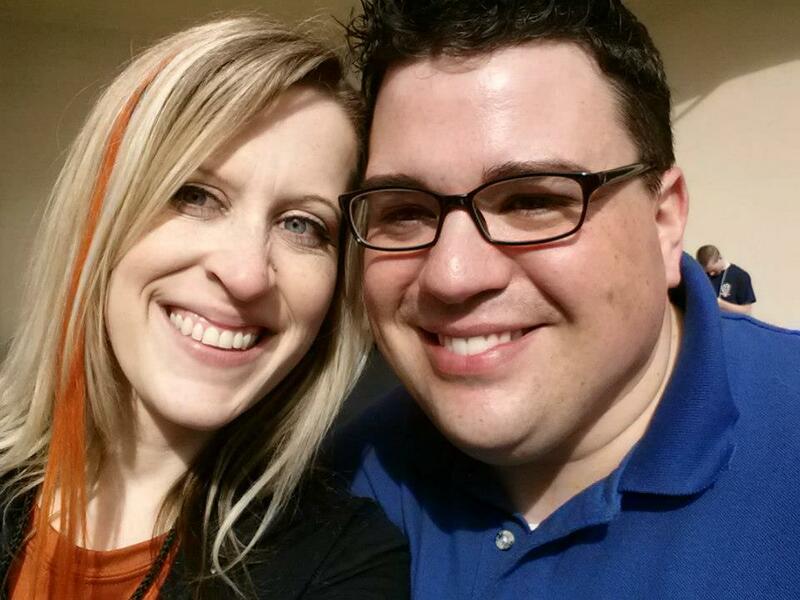 Megan is married to Chris Nettleton, the sports director for KBOI Channel 2. Chris suffers from MS, and has been a vocal and active supporter of MS Society events here in town, often lending his talents to emcee events. Me and Megan at "Meet Me Monday"
Just think about what most people do when faced with an MS diagnosis in the family. Sure, there are phases of anger, denial, depression, etc. But Megan not only went about arming herself with the knowledge she'd need to help and support Chris - but she also went to work for the one organization that will give them the most support during this ongoing fight. Megan has the unenviable task of being a one-person shop here in Boise, and I appreciate the positive energy and dedication she brings to the job. In 2008 his feet went completely numb. His doctor thought it couldn't possibly be MS because it was in both feet equally - so he went through a lot of testing, including electro-shock therapy on his legs, and muscle tests that involved shoving a 3-inch needle into his calves and moving it around to see if his muscles were working properly. Crazy, I know. Then he had an MRI and based on those results, his neurologist told him that he either had a brain tumor or MS. It is weird to say this, but luckily, it was MS and not a brain tumor. Because my husband is an all-or-nothing kind of guy, he went on a therapy immediately, which entailed me ramming a 3-inch needle intramuscularly into his thigh. And any of you that know my husband - he is majorly phobic of needles, but this was something we did for the next 2 1/2 years. And then one day he went in for a generic check-up, and surprisingly his liver numbers were way elevated. They discovered that the therapy had started to damage his liver, so he had to immediately go off of it. His only other option at this point for therapy: a DAILY shot. Great. But, my husband bravely endured it for one month, even though he had a severe skin reaction that caused his body to be covered in red, itchy, sore welts that never seemed to go way. What other choice did he have? Remember...all or nothing! It was then that the first pill for people with MS was released...TRIUMPH! He has been on it ever since, and has done very well! And this is all thanks to research...which brings me to my conclusion: please donate to our Walk MS Boise team to help raise money for research so more therapies may one day be available!" Of course, the funds we are raising for Bike MS contributes to the same research that helped provide new therapies for Chris. This concludes the 144th edition of the Carnival. The next Carnival of MS Bloggers will be hosted here on July 11, 2013. Please remember to submit a post (via email) from your blog of which you are particularly proud, or which you simply want to share, by noon on Tuesday, July 9, 2013. Hi there. I really like your site. I am a writer who also has MS. I am putting together a poetry anthology by writers who have MS. All poems talk about the MS experience. Proceeds of this book will benefit the MS community in Dallas, TX, where I live. Would you be interested in submitting a poem? Please contact me at dallaswestie@gmail.com. Thank you.